Outstanding Abelia with bright, variegated foliage that is yellow with green centers when young, maturing to ivory and green. Produces a heavy bloom of light pink flowers for a long period in summer and fall. 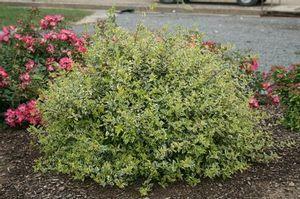 This Abelia hybrid is a rounded, spreading, multi-stemmed shrub in the honeysuckle family. Attracts hummingbirds and is deer resistant. Easy to grow and adapts to most conditions. Fertilize in spring with a slow release fertilizer.